Which is more credible E-mail or Science Journal? Does Record Heat in Anchorage prove/disprove AGW? There's a little heat-wave that's been occurring in Anchorage, Alaska. Those people that love to post questions about how cold weather in their city "proves global warming is false", seem to have missed this. Here's a quote about it from NOAA: http://pafc.arh.noaa.gov/pubfcst.php?fcs... AN IMPRESSIVE RECORD HIGH WAS SET ON FRIDAY, JANUARY 16...WHEN THE TEMPERATURE REACHED 50 DEGREES. THIS SHATTERED THE OLD RECORD HIGH OF 44 SET IN 1992 AND 1926. THIS NEW RECORD TIES FOR THE SECOND HIGHEST OFFICIAL JANUARY TEMPERATURE...AND ONLY THE FOURTH TIME THE MUNICIPALITY HAS HIT 50 DEGREES IN JANUARY SINCE RECORD KEEPING BEGAN. Does this prove, disprove, or have no bearing on the validity of the theory of Anthropogenic Global Warming? Who Started the "GW ended in 1940" rumor? Pros/Cons of Thorium based reactors? Hopefully dx/dy is reading this (as he's probably the best qualified regular around her to comment on this). Could thorium based nuclear reactors be the quickest and most cost effective solution for global warming? Is there any reason AGW doubters would object to this technology being promoted, even if they don't see the need to curtail CO2 emissions? What are the pros and cons of thorium based reactor technology? It seems safer, far more abundant, and possible to drastically reduce the need for on-going coal power generation plants (and their associated environmental effects). Do You Know More or Less about Global Warming? Compared to the average college educated (not necessarily in any physical sciences) citizen of the US, do people here think that they know more, less, or about the same with regard to the subject of global warming? Then please provide the basis for your opinions (e.g. read ?? ?, have degree in ?? ?, etc.)? Is This An Accurate Synopsis of the GW Media Problem? People who regularly read/write the actual scientific literature understand the ambiguities and subtleties of scientific research. But those who get most of their information from the media or personal blogs, seem to get a very contorted understanding. What do you think of this article ("Climate Experts Tussle Over Details. Public Gets Whiplash"): http://www.nytimes.com/2008/07/29/scienc... Two quotes that stood out to me were: "the focus by the public and media on the stream of evolving climate science could distract from the need for policies now that made sense regardless of uncertainties." "many studies had shown that people tended to sift sources of information to reinforce existing views." Is this Methane feedback mechanism a serious concern? Aerobic production of methane in the sea http://www.nature.com/ngeo/journal/v1/n7... "Continued greenhouse-gas-induced global warming could lead to enhanced stratification of the surface ocean and expansion of phosphate-limited, nitrogen-fixation-favorable marine habitats. Such climate-driven modifications could reinforce aerobic methane production, resulting in accelerated greenhouse warming and the ecological consequences thereof." Are there any studies that come to different conclusions? What are the qualifications for a TV Weather Person? Regularly, doubters post the opinion of someone that reads the weather on TV. Does that job really qualify a person to have any significant knowledge about climate science? Do people think TV weatherman typically take graduate level courses in atmospheric physics? Any graduate level science classes? Bachelor degrees? High school diploma? OK doubters, present your case for why you consider a TV weather person qualified as an expert witness in the debate over AGW? Or is this a classic case of the appeal to authority logical fallacy? Does This Help or Hurt Appropriate Response to Global Warming? Are we ignoring the real cost of oil? We all hear the complaints about $4/gallon to fill up at the pump, but are people still ignoring the real cost of our addiction to oil? If people had to pay the real price of gasoline at the pump, would they be demanding +100 mpg and electric cars from the big automakers? Milton Copulos was a conservative (served in the Reagan White House) and an expert on the oil energy industry. In this 2006 interview he estimates that the real cost of oil to our economy is (again from 2006) $480/barrel. That would be somewhere around $16/gallon at the pump (more in 2008). http://www.evworld.com/article.cfm?story... Even if global warmer were not a problem (which it is), surely there are more than enough reasons for us to aggressively move away from a fossil fuel based transportation system. And doing so will not only help our economy, but it will help fight global warming. Please read the article before responding in ignorance. 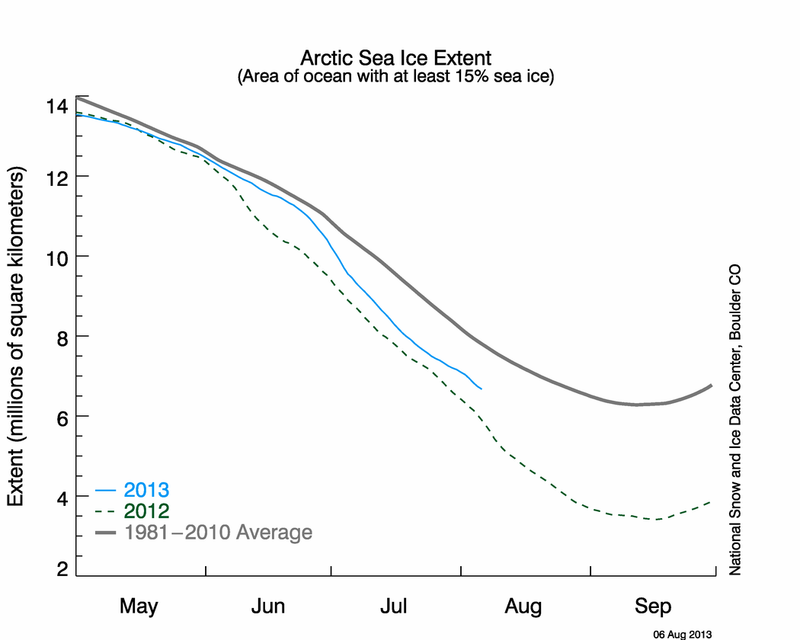 Should we expect another record year of Arctic Sea Ice melting? Can someone explain % vs. Quantity for Mars Atmospheric CO2? We've been seeing a lot of posts and questions from people that don't seem to understand the difference between percentages and quantity. They seem to think that because Mars has a high % of CO2 in it's atmosphere it should be hot, if greenhouse gas theory of warming were real. I'm looking for a concise, easily understandable (for the math impaired around here) explanation of why Mars atmosphere is high in CO2 yet Mars isn't hot. I know there are many detailed explanations and analysis of Mars atmosphere, but I think a 3 - 4 sentence paragraph might be better to help these individuals understand. 10 points to the best explanation. Will Global Temperature Need Upward Adjustment post 1945? A recent paper publish in the journal Nature indicates a data collection methodology change post WW2 that may require an upward shift of sea surface temperatures by as much as 0.3 C. http://www.nature.com/nature/journal/v45... Imagine how this graph would change if the post WW2 ocean temperatures were bumped up 0.3C: http://data.giss.nasa.gov/gistemp/graphs... Is this a significant finding which indicates that the warming has actually been greater than supposed? Is this paper simply incorrect? Or does this mean we should throw out all temperature datasets and declare them unreliable? Source of assertion CO2 is not Greenhouse Gas? Over the past week, I've read 2 or 3 doubters make the assertion that CO2 is not a greenhouse gas. None of the asserters (it may be the same individual repeating it) has provided any link as evidence to this claim. I'd have no problem with someone questioning the level of sensitivity, but an outright claim that it's not even a greenhouse gas sounds like something a non-scientist simply made up. So here's a chance for a doubter to shine (demonstrating their research skills) and get 10 points. What legitimate scientific source supports the assertion that "CO2 is not a greenhouse gas"? If someone can show a non-legitimate source making that claim, I'll consider giving you the 10 points as well. Is capitalism the solution for Global Warming? Why does the obsession with Al Gore, by doubters, continue? I seldom, if ever, see links to Al Gore's web-site to provide evidence that supports the theory of global warming. Instead, I see people like Bob, Dana, JS, d/dx d/dy d/dz, Alan J, gcnp58, etc. post links to actual scientific literature and respected scientific research organizations. If we were all going around saying "Al Gore said ...", then I'd understand the attacks on Gore. But Gore is insignificant to the truth/falsity of global warming. And only someone ignorant of the climate science community would think he's the source of any evidence for global warming. So, doubters, why do you continue to attack Gore? Do you really think that if everyone agreed Gore was a lying sack of sh** who's only in this for money, that would somehow disprove the science and eliminate the IPCC reports on global warming? I'd like to hear from the doubters what specific ways that a globally warmer climate will be good for our civilization and species. And what would be considered too much warming? Please provide links to reliable sources for your views. Personal assertions and opinions around here tend to be quite inaccurate at times. What's the source for the claim Antarctica is gaining ice? What's the best approach to deal with AGW? Does the Ozone Hole show the urgency of Action for Global Warming?